1st Single From CD Released! By Swansong, May 1, 2013 in Good News!!! The piece features words and music by Bonnie Anne Hudson Pinard, orchestration, mixing and mastering by Nathan Allen Pinard, vocals by Toni Gibson, and violin by Maria Lazareva. Greetings fans and friends! You have read the lyrics throughout my book, and you’ve been hearing about the production of our CD. Immortal Aria is pleased to announce that the first single from the Chanson de l’Ange CD: “The Bleeding Rose” featuring Toni Gibson is now available for download! Inspired by the breathtaking Phantom of the Opera retelling, The Bleeding Rose features words and music by Bonnie Anne Pinard, with atmospheric orchestral accompaniment by Nathan Allen Pinard. 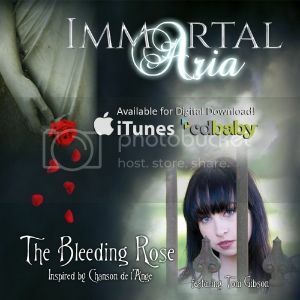 Classical Crossover artist Toni Gibson’s haunting vocals and Maria Lazareva’s tender violin lend The Bleeding Rose a timeless beauty, reminiscent of 18th century Art Songs. Through its romantic prose, The Bleeding Rose communicates the universal theme of unrequited love. Please post your review on itunes and here if you wish!